WA | S&P Canada Ventilation Products, Inc. Exhaust air up to 4,520 CFM with static pressure capabilities to 1/2" w.g. 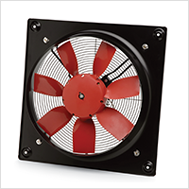 The COMPACT Axial Wall Exhaust Fan is an extremely compact design created by the combination of an external rotor motor matched with a direct drive wrapped around an impeller hub. 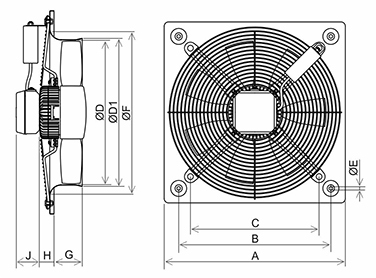 This very low profile design optimizes airflow performance while minimizing noise generation. WA's are designed to be installed directly into side walls, ceilings and panels in order to exhaust or supply air to the surrounding environments. All WA Fans include a one piece bell mouth inlet and mounting plate manufactured from high grade galvanized steel. The motor and fan impeller assembly are firmly supported within this mounting plate by a strong steel support frame that includes an integrated finger guard on the inlet side. All units are supplied with motors prewired to a wiring junction box located on the back of the motor hub for easy wiring access. This terminal box protects all wiring connections against the ingress of dust and moisture. The entire assembly is protected by a two stage primer and a tough corrosion and UV resistant polyester paint finish. 12 15-3/4" 12-15/16" 11" 12-7/16" 12-5/8" 3/8" 12-15/16" 2-11/16" 1-1/4" 2-9/16"
16 19-11/16" 16-5/8" 13-15/16" 15-3/4" 16-3/16" 3/8" 16-5/8" 3-1/16" 1-5/8" 2-9/16"
18 22-1/16" 18-3/4" 15-3/4" 17-3/4" 18-1/16" 3/8" 18-3/4" 3-9/16" 1-7/8" 2-9/16"
20 24-13/16" 21-1/16" 17-3/4" 19-11/16" 20-3/16" 3/8" 21-1/8" 3-3/16" 1-3/4" 2-9/16"